It’s a historic first. Trump told Sean Hannity that he really believes that Kim will now begin to work towards dismantling his country’s nuclear program “virtually immediately.” In response, President Trump has halted joint military exercises with the South Koreans, for now at least. They are seen as provocative by the North Koreans. Our troops will remain in South Korea as this moves forward. 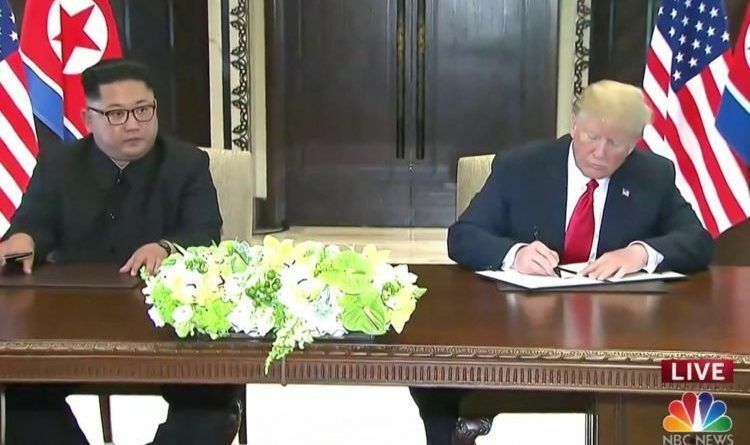 A comprehensive document was signed by the two leaders stating Pyongyang would work toward “complete denuclearization of the Korean Peninsula ” and that the U.S. would provide “security guarantees” to Pyongyang. “We are going to leave the past behind. The world will see major change,” Kim Jong-Un said signing the document. Those are just words, but we all pray that they are the truth this time. Trump also says he will have Kim to the White House and that they will meet many more times over all of this. In Hannity’s interview with the President, Trump said the process is “really moving rapidly.” “I just think that we are now we are going to start the process of denuclearization of North Korea, and I believe that he’s going back and will start it virtually immediately – and he’s already indicated that and you look at what he’s done,” Trump stated. All of this happened after several meetings yesterday in Singapore. CNN’s Jim Acosta asked Trump if Kim agreed to denuclearize and he said, “We are starting that process very quickly.” Kim agreed to destroy a “major” missile testing site, but did not offer specific details. ← All the Nuclear Missile Submarines in the World in One Chart – Guess Who Is Number One!